It’s that time again! The students and staff of the Shirley Alternative Learning Center (SALC) are getting ready for their annual holiday food boxes. Every year during both the Thanksgiving and Christmas holidays, SALC works hard to purchase, pack, and provide food boxes for families in our community who are in need of a little help in order to make the holidays a more enjoyable time. Throughout the year, food boxes are put together with a wide variety of canned goods and other non-perishable foods. These boxes are then donated to families in our area. In years past, the Shirley Food Pantry only provided food boxes to families with children who attended Shirley School District. 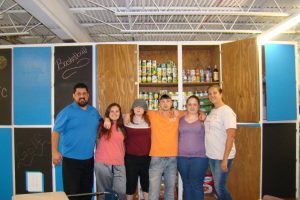 However, as time went on and times got harder, the food pantry was able to expand its shelves a bit and provide to others in the community as well. Some may be single parents who have younger children not yet in school. Some may be elderly individuals who just need a little help making it through the month. Regardless of the situation, Shirley Food Pantry does its best to help take care of this need in our community. During Thanksgiving and Christmas, SALC staff, in conjunction with the teachers and administration of Shirley School, puts together a list of children and families in our district who we feel are good candidates to receive holiday food boxes. SALC staff will then contact the head of the household offering the service of the food pantry. Occasionally, there will be a family who has been able to provide without help and wishes to donate their box to another family. This is great news! With the lack of jobs in this area, it is always good news when parents/guardians are able to find work to be able to provide for their families. Once the calls are made and the boxes confirmed, it is time to go shopping. With the help of donations made by individuals, churches, and other organizations in our community, SALC is able to place big food orders with Wal-Mart and purchase all the food needed to fill the boxes. Not only will families get a regular food box like the ones given out all year, they will also receive a Thanksgiving/Christmas dinner box that has all the fixings for a family feast complete with pumpkin pie and a turkey or ham. Last year alone, SALC sent out approximately 120 boxes during each holiday. Although the days get long and busy in SALC during the weeks before the holidays with trying to make sure all the students have all the work completed for their classes, there is still time being made to put together the fantastic food boxes for our community. Nothing says thank you quite like seeing the looks on the faces of the families we help. This is a list of the items we try to keep on hand, as well as some that are needed. Any contribution will be greatly appreciated: canned vegetables: corn, peas, green beans, carrots, potatoes; canned meats: tuna, salmon, ham, Vienna sausages; canned beans, dry beans, boxed goods: mac & cheese, potatoes, hamburger helper, pancake mix, syrup, cereal, peanut butter, jelly, Jello, crackers, instant oatmeal, spaghetti sauce, canned fruit, fruit cups, canned soups, canned chili, flour, sugar, condiments, oil, cranberry sauce, and any other non-perishable foods. We do not have access to a freezer for anything that needs to be stored cold. We would also like to begin helping more with toiletries and paper products, like Toilet paper, Paper towels, Paper plates, Plastic utensils, Shampoo, Conditioner, Body wash, Bar soap, Deodorant, Toothbrush, Toothpaste, and Feminine hygiene products. Thank you! Anyone wishing to make a donation of either money or food to help the Shirley Food Pantry is welcome to contact Angie Williams at the Shirley Alternative Learning Center. Phone: (501723-4907, e-mail: [email protected] Mailing address: 201 Blue Devil Drive Shirley, AR 72153.